The Magic Bus “Passive” interface looks like this. This interface displays the map without any interactive controls. There is an optional “GET” parameter “stop” that takes a numeric stop ID and centers the map on that stop, so you can zoom in on a particular region of the map. If you decide to use the “Passive” interface, you can add additional information like the examples provided in the screenshot below. 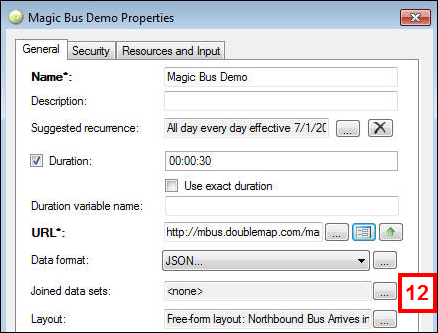 You can add the Magic Bus logo via an “Image” content type (the logo is saved in the Digital Signage Shared Content folder), and you can add Live Data objects to display the Announcements from the MBus site and the ETA data for bus arrival times. 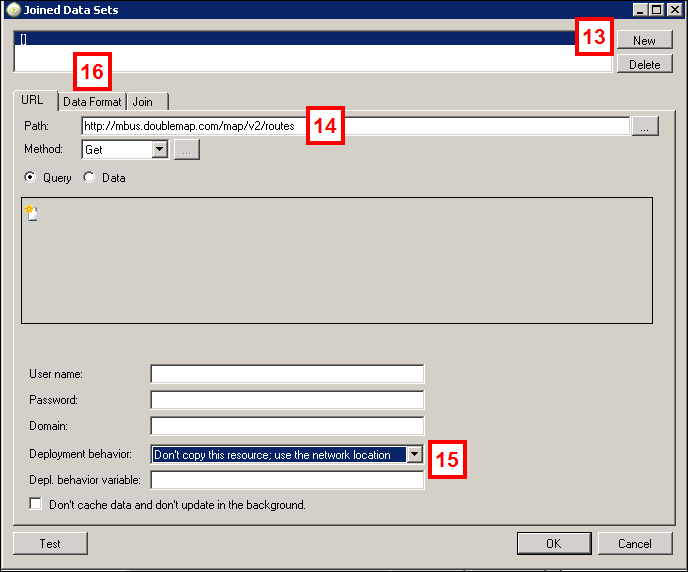 The steps for adding the Announcement feed and the ETA data are provided below in this document. Note: There currently is no “key” or “legend” for the routes if you use this interface on your digital sign. You can create one with another Live Data object, but as of now, there is no pre-defined image that you can use. 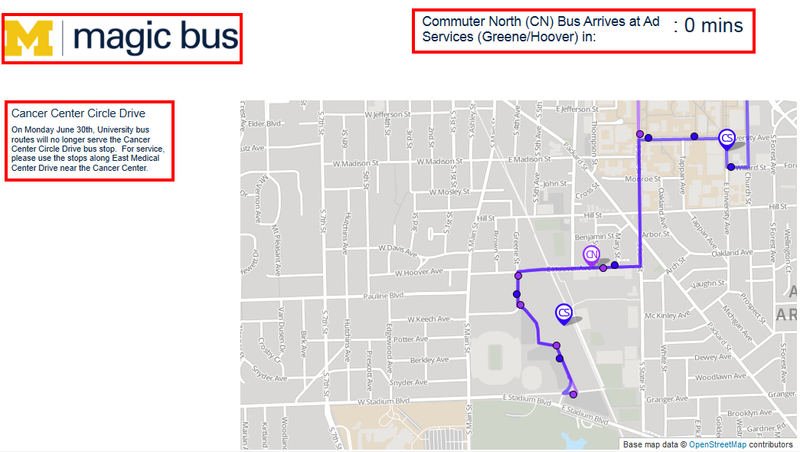 These instructions will guide you through how to create a textual representation of buses arriving at a specific stop. Select JSON from the Data format drop down list, and then click the ellipsis button . 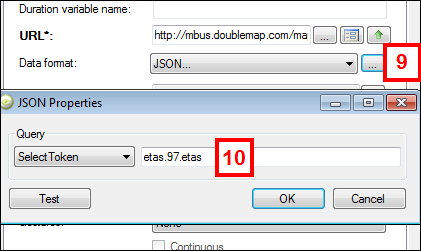 In the JSON Properties dialog box, enter etas.97.etas, where 97 is the stop for which you want to display the arrival time of the next bus. Click OK to return to the Live Data Properties dialog box. 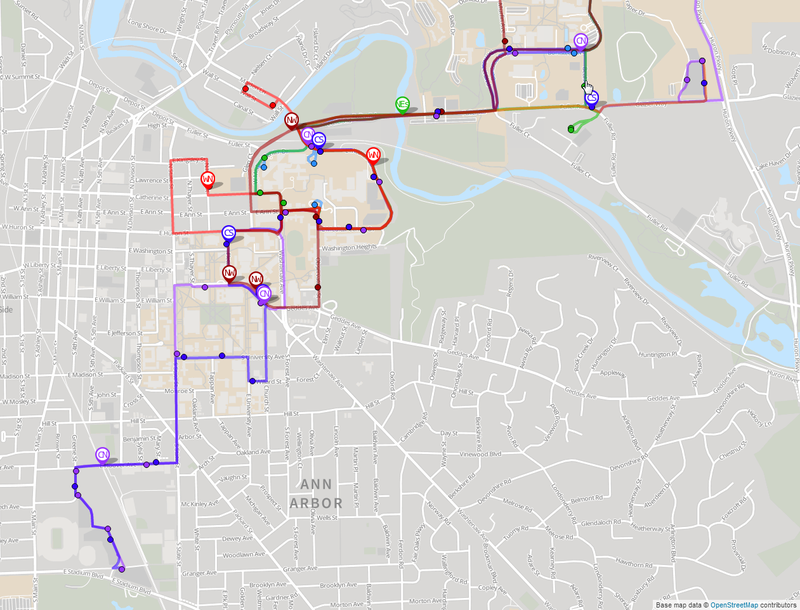 Note: The URL used to pull arrival times of buses for a particular stop returns the ID of the buses arriving; however, bus routes regularly change in the evenings, on weekends, on semester breaks, and during the summer. Due to the changing routes, it is necessary to dynamically pull route names for each stop, rather than using static route IDs. Doing this will correctly identify buses arriving at the stop, even if the routes change. 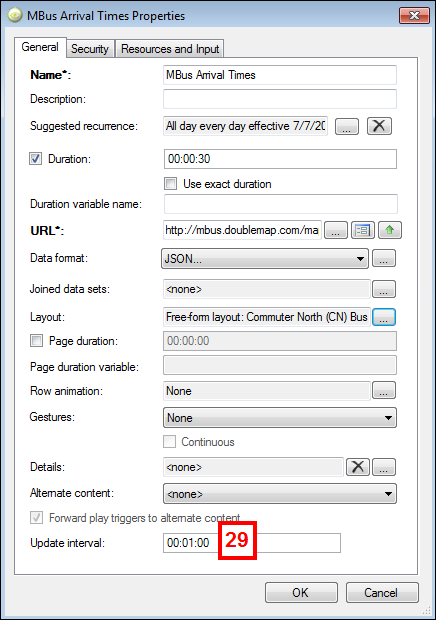 To add this dynamic lookup, use a joined data set to the routes URL. 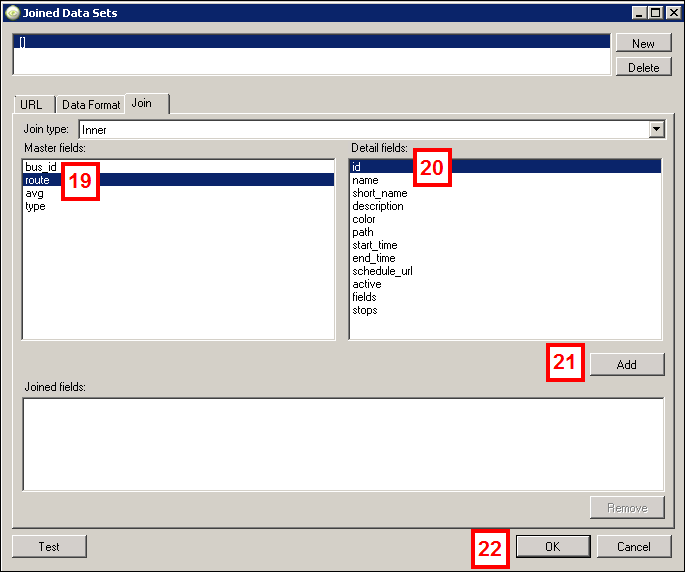 Click New in the Joined Data Sets window to create a new joined data set. 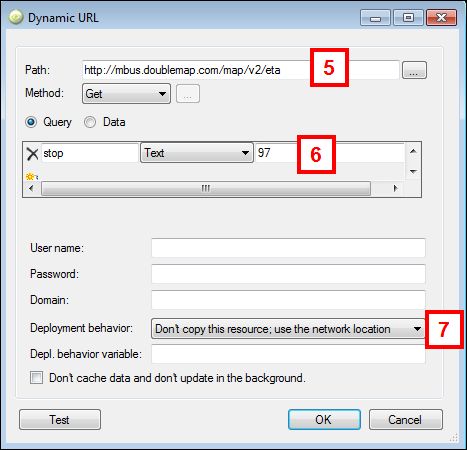 Enter the route's URL: http://mbus.doublemap.com/map/v2/routes/ in the path. Change the deployment behavior to Don’t copy the resource; use the network location. Click the Data Format tab. 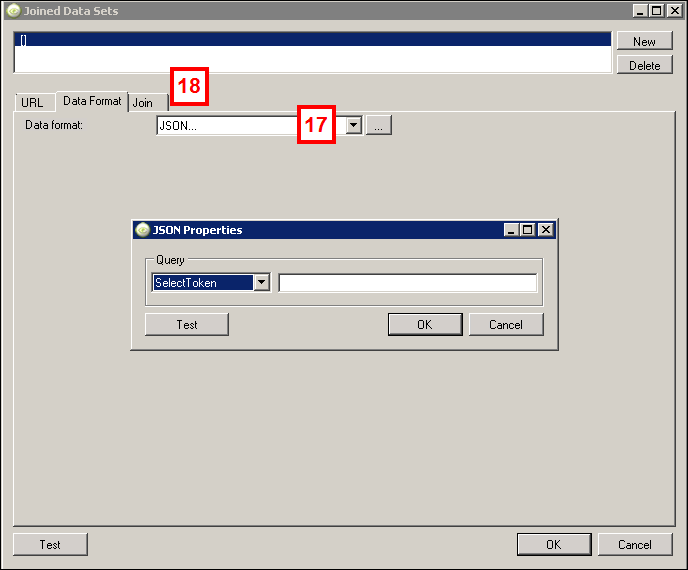 Select JSON from the Data format drop-down list and click OK on the JSON Properties window. 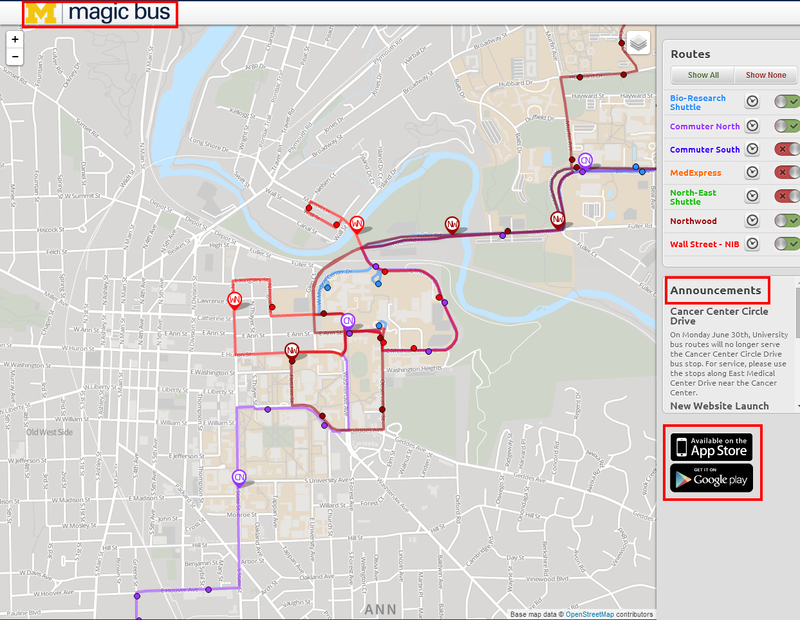 Note: In this section, we connect the id of the bus arriving at the stop to the name of the route in the routes data. Click route in the Master fields. Click id in the Detail fields. Click Add to create a join between these two fields. The join should appear in the joined fields at the bottom. Click OK to return to the live data properties window. Click the ellipsis next to the Layout field. Note: The live data layout should contain all the fields from both the eta URL and the routes URL. 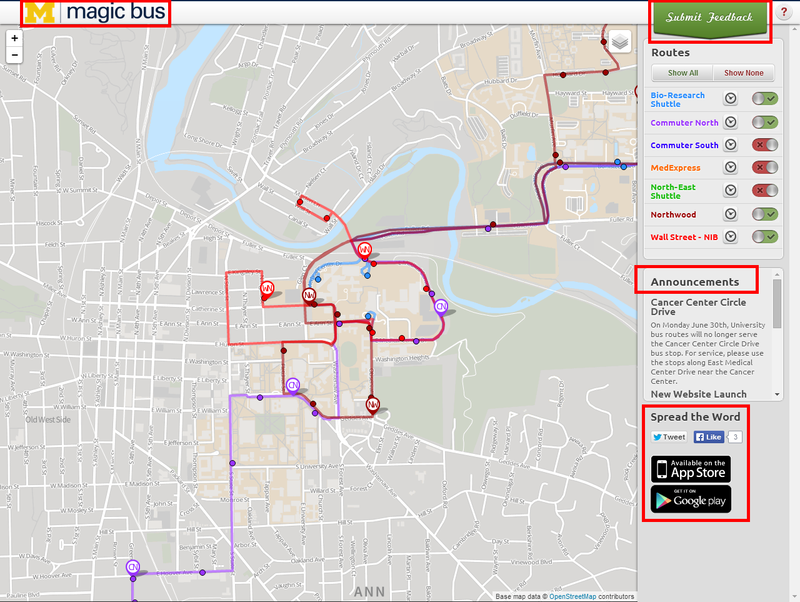 Because of this, we can combine the route name with the ETA to provide a textual, easy-to-read representation of incoming buses. The layout design is entirely up to the user. For more information, please review Configure the Layout of Live Data Content. The layout details below are helpful hints to making the live data easier to read. After adjusting row height and width, drag down name from the Data fields to the layout. This contains the name of the route which will be stopping at your identified stop. If there are multiple buses stopping at the stop, you may consider using a group-by field. This will collect arrival times for each route in to labelled sections. To do this, choose add group by band from the Options drop-down list near the bottom-left of the window. This will provide another section to the layout (the height can then be adjusted using click and drag or the Group by adjuster below). Drag name to this section (instead of the row). This appears in yellow. Drag the avg field to the Sort Order tab at the top. This will sort the arriving buses beneath each header by how much time there is until the bus arrives at the stop. Drag type to the Filter tab. In the filter, click Value. Select live from the drop-down list that appears. This will ensure only active buses appear on the screen. Enter one minute 00:01:00 in the Update Interval field. Click OK to close out of the Live Data Properties. The final step is to drag the new Live Data content object from the Content area of Content Manager into the Network Overview, specifically, in the region you’ve designated in the template for this content object.